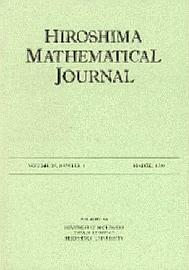 Hiroshima Mathematical Journal (HMJ) is a continuation of Journal of Science of the Hiroshima University, Series A, Vol. 1 - 24 (1930 - 1960), and Journal of Science of the Hiroshima University, Series A - I , Vol. 25 - 34 (1961 - 1970). Starting with Volume 4 (1974), each volume of HMJ consists of three numbers annually. This journal publishes original papers in pure and applied mathematics. HMJ is an (electronically) open access journal from Volume 36, Number 1. Copyright © by Editorial Board of Hiroshima Mathematical Journal. Newer Volumes can be seen via Project Euclid. Last modified on April 24, 2018.